The idea that an electric bike is ‘cheating’ and ‘does all the work’ is a misconception held by many. Electric bikes aka e bikes have great value in getting people back into cycling after an illness or getting people into cycling that have never ridden before. Electric bicycles or battery bikes in general are designed to be ridden in pedal assist mode. This means that the rider is putting in effort and the motor is assisting. Some electric bikes have a feature whereby the rider can vary the amount of assistance given by the bike, whilst others have the ability to be ridden without pedaling at all. The ability to go completely under power may be useful if a rider can only put in effort for a short time and then need a ‘breather’. This allows them to either continue their journey, or when out riding with other companions, to keep up and not delay the ride. To use an electric bike as an aid to rehabilitation or improving fitness, select one that offers adjustable power levels. Start out with the setting on high or maximum assist. The rider will be putting in a minimum amount of effort and the bike will be doing lots of the work. As fitness improves the power can be reduced allowing the rider to put in more effort. The assistance level can easily be raised again to give extra help on hills or if you want to increase the distance ridden. If you choose a bike with ‘torque sensor’ technology the bike detects pressure on the pedals, the harder you push on the pedals the more assistance the bike gives you. So for example, if you are riding on the flat and only pressing gently on the pedals the bike gives you a small amount of assistance. If you want to go faster, there is a head wind, or a hill and you increase the pressure on the pedals the bike senses this and puts in more power accordingly. Electric bikes that offer ‘launch assist’ or a throttle override can be very useful in setting off. The initial push to get going on a bicycle takes more effort than that required to maintain speed once riding. The ability to select ‘instant’ help as you set off is also a definite advantage when starting on an incline or even if you have stopped in the ‘wrong’ gear, which means it takes far more effort to get moving. When setting off in traffic, either in a queue or at traffic lights the danger of going too slow is that this can make the rider slightly unstable, extra assistance here can bring the rider up to a more stable speed very quickly. At the start of any fitness programme, whether it is for general fitness or for rehabilitation after illness or injury, maximum exertion and endurance levels can be very low. An electric bike gives the rider the confidence to try inclines and distances that they would otherwise consider unattainable because they have the back up of additional power should they require it. Exercising alone is not very attractive to some people; indeed this can mean that they do not do it at all. A cycle ride with friends and family is a much more attractive option, the advantage of using an electric bike is that the less able person can still keep up with the other members of the group. Very often a key part of rehabilitation after illness is being able to feel like you have returned to normal, riding with friends can help with this. An electric bicycle can make the difference between thinking that cycling would be a great way to get back in to exercise and actually getting out there and enjoying it. Batribike was approached recently by the British Heart Foundation to discuss using electric bikes as an enjoyable and effective means of rehabilitating heart patients. They have an editorial promoting cycling in the forthcoming April edition of their Heart Matters magazine. I realised that rehabilitation is a big issue and so I have written an article on the Health Benefits of Electric Bicycles. Electric bikes continue to make interesting reading in the cycling press. The Batribike Micro is reviewed today by BikeRadar. Batribike are delighted to welcome Marine Dogny to the team. Marine is on a five week placement with us from university, she is studying International Business at Lycée Saint Jude in Armentières, Northern France. Marine is bi-lingual in French and English and also speaks Spanish. She has a keen interest in sport and is very pleased to be working with Electric bikes. Yesterday I started to think about how people who are worried about technology get on with Electric bikes. Then somehow the comparison for choosing a new electric bike and choosing a new laptop leapt into my mind! They seem so dissimilar – which they are in purpose – but actually the mind set is bizarrely the same. I recently changed from a ‘normal’ windows laptop to an Apple MacBook Air, its stylish lines, light weight and the long time it lasts on the battery were very attractive – you see what I mean? These are exactly the criteria that most people use when choosing an electric bike! Electric bikes are like that, they get under your skin without you really noticing. Some of our customers have said that they really would like an electric bike but they can’t do anything complicated and they don’t do technical stuff. I have explained how easy they are to use, you can just get on and ride don’t even have to adjust anything if you don’t want to. Once the customer has been on a test ride and seen just how easy it is they start to think, so how can I change this setting? All of a sudden it’s not as complicated as they thought. When I first started in the Electric bike business I thought that I would ride them when I had to, but keep my old pedal cycle for most of my riding, then I became the test rider for Batribike. I have so enjoyed riding the bikes that I haven’t actually been out on my old bike since and it is languishing in the garage (poor bike) In fact my planned rides for December had to be cancelled due to unforeseen circumstances and I have really missed them, I hope I can get out there again soon. So the moral of this ramble is don’t worry about the technology on an electric bike get out there and have a go – you’ll wonder why you didn’t try one before! Having just had four days in London at the London Bike Show at ExCel we were back up in the capital again yesterday at the House of Lords for a meeting of BEBA. The meeting was well attended with existing members and new ones looking to join. As usual there was much to discuss in relation to electric bicycles and an interesting presentation from ACT. BEBA is forging ahead with plans for some new totally independent research into who uses electric bikes and how other road users perceive them. This sort of research will be useful to the Electric Bike industry as a whole. Discussions and networking went on well past the intended end of the meeting so we didn't get lunch until four o'clock, followed by a short meeting of the working group. This actually worked well for us as we had chosen off peak travel on the train! I was amazed by the amount of flooding in the fields that we could see on the way up to Liverpool Street (too dark to see on the way back) The rivers had really burst their banks and there were lots of trees ankle deep in water. 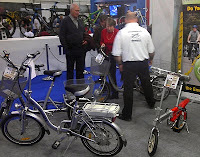 Electric bikes were a hot topic at the London Bike Show with several manufacturers and suppliers displaying their range. The Batribike stand proudly displayed the BEBA. The show is a new event for the bike industry, the co location with the Outdoors Show and the London Boat Show seems to have been popular with the event visitors giving value for money for a full day out. A huge amount of interest was shown in the Electric Trikes. Batribike has two different sizes available. The smaller narrower version TRIKE 16 being particularly suitable for those with limited storage options as it is small enough to fit through a standard doorway. The slightly larger TRIKE 20 has capacious baskets for load carrying. 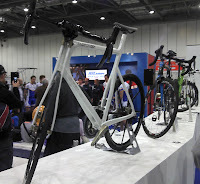 Around the show there was lots to see including the 'Cool Wall' for pedal cycles. The London Bike Show is an all new event running from tomorrow until Sunday at ExCel in London's Docklands.A ticket to the London Bike Show also gives you entry to the Outdoor Show and the London Boat Show which are running concurrently. We at Batribike are excited about the show and will soon be all set up and ready for tomorrow. Electric Bikes are currently very much in vogue for commuters and the show is a great place to come and test ride a battery bike on the commuter test track. Have you made any New Year's resolutions this year? The usual over indulgence over the Christmas period probably means that many of us are wanting to get some exercise in the next few weeks and shed a few pounds along the way. A battery bike from Batribike may be the perfect partner to help you get back into shape! Statistics show that those with an electric bike are far more likely to use it on a regular basis than those with ordinary pedal cycles. Having the knowledge that you can get help when the hills make it tough going or using power to get back after a workout really makes the difference. With long range and power for the hills we are sure to have something to suit you. Why not take a look at our range at our showroom or come along to one of the shows we are attending in 2011 and let Batribike help you to turn your New Year's resolutions into New Year's Revolutions!